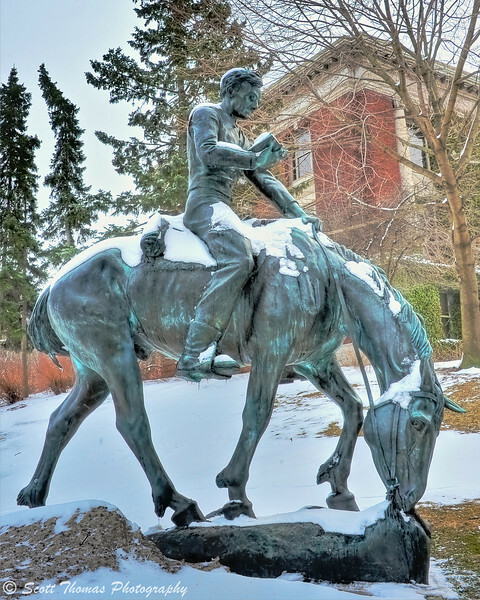 "On the Circuit", a statue by Anna Hyatt Huntington (1876-1973), depicts a young Abraham Lincoln reading a book on horseback on the SUNY College of Environmental Science & Forestry campus in Syracuse, New York. Nikon D700/28-300VR, f/16, ISO 200, EV 0, 82mm focal length, HDR Image. Last year I showed you a statue of Abraham Lincoln on the Syracuse University campus. That statue depicted a deep thinking Lincoln. Next door to SU, another statue of Lincoln resides on the State University of New York College of Environmental Science and Forestry which was created by artist and ESF alum, Anna Hyatt Huntington. The statue titled, On the Circuit, shows a young Lincoln in Illinois back in the 1840’s riding a horse and reading a book on his way to the next town to offer his services as a lawyer. The circuit took Lincoln away from his home for six months each year and covered over 400 miles. Here is the whole statue on the SUNY-ESF campus with Bray Hall in the background. 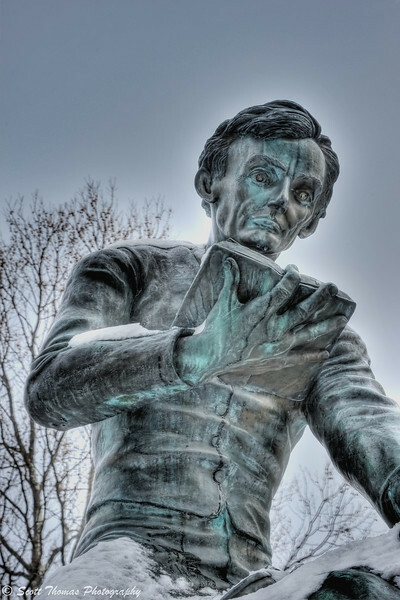 This entry was posted in Weekly View and tagged abraham lincoln, book, campus, circuit, college, esf, history, horse, lawyer, new york, president, reading, statue, suny, syracuse. Bookmark the permalink. Huntington had an interesting take on Lincoln, and you did a great job of conveying the essence of the sculpture. I wonder if anyone has ever done a laughing Lincoln? Lincoln had a quick wit and loved to tell humorous stories. I’d imagine there is one somewhere. Nice photo(s) of Lincoln. Is the greenish cast from iodized copper? He always strikes me as someone to admire. I wonder how he would fare in today’s political climate? I wonder how anyone fares in today’s political climate. Seems the really smart ones do not enter the arena. We end up with savvy people who know how to get elected but have no ability to get things done. The statue is made of bronze as is the other Lincoln statue. I didn’t know that Lincoln was a circuit lawyer… (yes, I DID know he’s a famous USA president who was assassinated). How would he have faired in today’s politics? Who knows, maybe he would have “worked” the media machine, maybe he would not have fitted the “image” that people want to see ( and hear), He was possibly a man for his time, and only his time. Interesting question. Ah, you’ve hit it. He was a Man of his time. This is something I point out to my daughter who’s job it is to represent the Theodore Roosevelt Center (another US President). At times she is not to thrilled with some of the things she uncovers about Teddy which do not jive with her thinking. I remind her he lived in a time where his thinking was normal. Just as Lincoln’s was. I like the perspectives and composition BUT, the HDR simply isn’t workin’ for me. In the first one, it’s makin’ Lincoln look really creepy and in the second, eveything is just sort of flat – all highlights and no shadows to give depth. The light was flat which is why I went HDR. With the buildings surrounding this statue, I doubt there is any nice natural lighting at time of day or year. Thank you for being honest, Tracy! I really like the glow created in the first photo. I think young Lincoln must never have looked very young. I had never tried HDR before, it does make the image looks like a painting. I like the 2nd image best, I see he used his time wisely.